DOWNTOWN BROOKLYN — Two Bushwick slumlords will avoid jail time under a plea deal hammered out Tuesday, under which they have to pay nearly $350,000 to tenants they harassed and intimidated with pitbulls and sledgehammers. 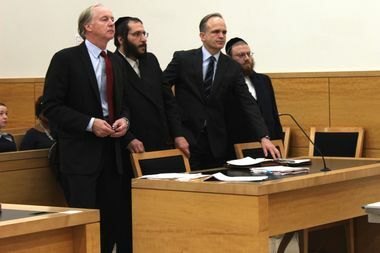 Joel and Amrom Israel confessed in Brooklyn Supreme Court to a felony scheme to defraud and three counts of unlawful eviction — a misdemeanor. The brothers admitted they used the harsh and unlawful tactics in order to intimidate rent-stabilized tenants to leave their apartments, so they could renovate and charge market rate prices. About $250,000 will go directly to 10 tenants as restitution, while the slumlords will have to fork over an additional $100,000 to the state's Tenant Protection Unit which will set up a fund for tenants to claim further money for other expenses they had to pay for during the time they were being harassed. Under the deal brokered by prosecutors Gavin Miles and Samantha Magnani, the brothers have six months to pay the tenants back or they could still serve up to four years in jail. If they comply, they'll get five years probation and 500 hours of community service. The charges stem from a 2015 indictment accusing them of abuses at five of the brothers' North Brooklyn buildings including 98 Linden St., 324 Central Ave. and 386 Woodbine St. in Bushwick, 300 Nassau Ave. in Greenpoint and 15 Humboldt St. in Williamsburg. The landlords hired vandals to intimidate tenants with pitbulls, bats and sledgehammers and got others to come in to party and do drugs in the hallways, according to the plea deal. And at 98 Linden, residents of two apartments lived for 17 months without bathrooms or kitchens when they were told they were getting repairs and instead they were demolished and left with gaping holes in their apartments. "We were living with rats and cats in my kitchen. Street cats would come inside," said Michelle Crespo, 35, who has lived her entire life in the apartment she shares with her two sons, her brother, her mother and step-father. Her cousin across the hall also had her kitchen and bathroom ripped out by the landlords, so for that time they all used an aunt's facilities in an upstairs apartment. In total, it was 13 people using one bathroom for over a year. "Every single person had somewhere to go in the morning, whether it was school or work," she said. "We'd line up starting from 5 in the morning on." The brothers have finally repaired the kitchen and bathroom, she said. Crespo will get $12,828 under Tuesday's agreement, but when she learned the Israels had pleaded guilty, the money was the last thing on her mind. "Just having this day come finally is such an amazing feeling," she said. "It makes us feel that we are human. We are capable of getting justice." On their way out of the courtroom Tuesday the brothers declined to comment. Their lawyers Kevin Keating and John Carman later released the following statement: "The Israels have chosen to put this matter behind them and are cooperating fully to ensure that the rights of their tenants are protected."